SALT LAKE CITY — Rudy Gobert noticed something upon his return to NBA action on Thursday night in Houston. A five-week absence helped his hops. The Utah Jazz are also feeling great — and are certainly capable of reaching higher than they have been — with their 7-foot-1 defensive anchor back in the lineup. Gobert, who'd missed 18 games with his knee injury, played an instrumental role in the Jazz’s 98-83 defeat of the Miami Heat, scoring nine points with five rebounds, four assists and, perhaps best of all, four blocked shots. The final block came late in the game and just about caused Jazz fans to scream even louder than when they roared after winning free chicken sandwiches thanks to two missed Hassan Whiteside free throws in the fourth quarter. Gobert was restricted to 15 minutes in his first game back Thursday against the Rockets after being sidelined with a sprained left MCL. On Saturday, the Stifle Tower was on the court for 28 ½ minutes. Gobert credited his teammates for the win, which snapped a three-game losing streak. Defensively, though, the Jazz’s defensive success all starts with Gobert in the middle, so that’s why his teammates are thrilled to have him back. QUICK UNDERSTUDY: Gobert credited his backup, third-year center Jeff Withey, for filling in nicely for him while he was out. “He got better. He got more confidence,” Gobert said of Withey, who’s averaging 5.0 points, 4.4 rebounds and 1.4 blocks in only 15.6 minutes (numbers similar to Gobert’s per 36, by the way). HEATED SHOWDOWN: This was the first duel for Gobert this season against Miami center Hassan Whiteside. The Jazz center missed the teams’ first meeting with a sprained ankle. While Gobert had his nice stats, Whiteside finished with 10 points, 11 rebounds and four blocks. However, the Jazz outscored Miami by 10 points while Gobert was on the court, while the Heat gave up five to Utah while Whiteside was out there for 30 minutes. SNAKE-BITTEN? : Gobert was bummed that Rodney Hood got injured in the first game he played in since the end of November. Gobert did offer some hope for those who want Hood to return soon. 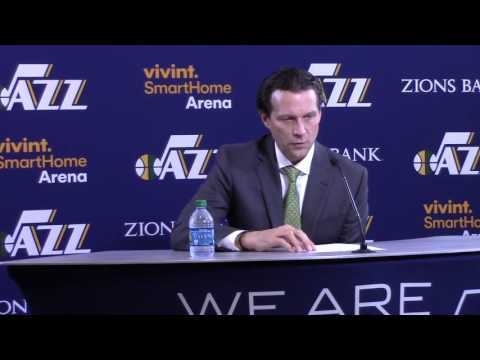 Jody Genessy Jody is a sports writer who covers the Utah Jazz for the Deseret News.